Are you considering a Wildflower themed wedding? American Meadows has been America's Favorite Wildflower Seed Store for over 25 years. We have all the resources to help you with both Wildflower Wedding Favors and Wedding Plantings. If you have any questions or need help of any kind, please simply either email us, or call our Customer Service Department toll-free at: (877) 309-7333. We have two packets designed to be perfect for wedding favors, wedding parties, or mailing with thank you notes after the ceremony. "Wildflowers from Our Wedding. Thank you for helping us celebrate our special day. We hope you'll take these seeds and plant them in a place dear to you. As they grow and bloom, remember the wonderful times we've shared. Our "Wildflowers From Our Wedding packet is a favorite with brides. The seed mixture inside includes the same flowers shown on the front — red poppies, blue cornflowers and more — all flowers that grow easily anywhere, and can be planted in spring, summer or fall. Packet size is 3-1/4" x 4-1/2". "It makes us so happy to have you with us to celebrate our love. We hope you'll take this small souvenir of our ceremony and plant the wildflower seeds. As they grow and bloom, we hope you'll remember us and this happy day." This unique group of five separate seed packets collected into an elegant 5-1/2" x 7-1/2" full-color presentation packet, features the favorite wildflowers of love and legend. Who was Black-eyed Susan? And what was her relationship with Sweet William? How did the lovely flower, "Love Lies Bleeding" get its name? How was the "Bachelor's Button" used to attract young men? And who shouted "Forget Me Not!" as he was swept away from his lady love? All these legends are explained on this elegant package, and seed for each flower is included in separate seed packets inside. We don't make up the individual favors, sachets, or gifts, but simply deliver the seed to you in sacks like the one in the photo below. How you use and decorate the seed is up to you. Small white organza or satin drawstring bags, like we used for these samples, are available at craft and party stores, and also online at OrientalTrading.com. All you do is add ribbons and silk flowers. Any of our regular wildflower mixtures or sacks of your favorite individual wildflower seeds are fine for wedding use. Favorites include our All-annual Mixture, and various favorite single wildflowers. You can choose any mixture or species and make up your own custom mix. Favorite economical wildflowers to use are Cornflower, Crimson Clover, and Baby's Breath. Forget the Rice. Throw Wildflower Seeds! Here's another great idea for a Wildflower Wedding. Most brides make up little net or satin sachets of seed before the reception, and then have them handed out as the bride and groom are preparing to leave. Instead of showering the happy couple with rice, guests love tossing wildflower seeds. 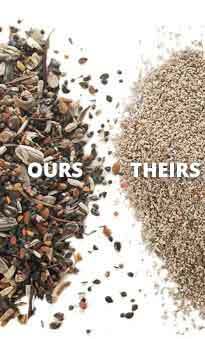 To choose seed for throwing, we'd suggest the least expensive wildflower seeds, which are mentioned above. Choose your favorite or choose several and make up a mixture! For photos and more facts about all your wildflowers, click here and choose your region from the maps then you'll see "Individual Species" for your region, which lists all the flowers. It seems more and more brides are using flower bulbs for wedding favors. And why not? A lily bulb in spring or summer, a tulip or daffodil in fall; any bulb makes a lovely, living take-home gift from a wedding event. They cost very little, and can be dressed up in satin sacks and ribbons just like wildflower seeds.